Frontal areas between warm and saline waters of the Kuroshio currents and colder and diluted waters of the East China Sea (ECS) influenced by the Changjiang River were identified from the satellite thermal imagery and hydrological data obtained from the Coastal Ocean Process Experiment (COPEX) cruise during the period between March 1st and 10th, 1997. High chlorophyll concentrations appeared in the fronts of the East China Seas with the highest chlorophyll-a concentration in the southwestern area of Jeju Island (~2.9 mg/m3) and the eastern area of the Changjiang River Mouth (~2.8 mg/m3). Vertical structures of temperature, salinity and density were similar, showing the fronts between ECS and Kuroshio waters. The water column was well mixed in the shelf waters and was stratified around the fronts. 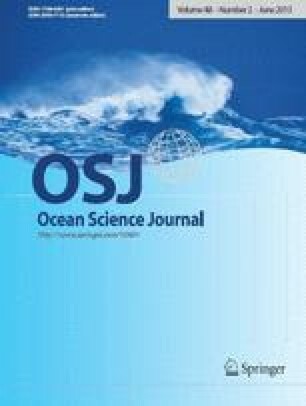 It is inferred that the optimal condition for light utilization and nutrients induced both from the coastal and deep waters enhances the high phytoplankton productivity in the fronts of the ECS. In addition, the high chlorophyll-a in the fronts seems to have been associated with the water column stability as well.